To the dwellers of the plains there is an appeal to the hills which is irresistible. 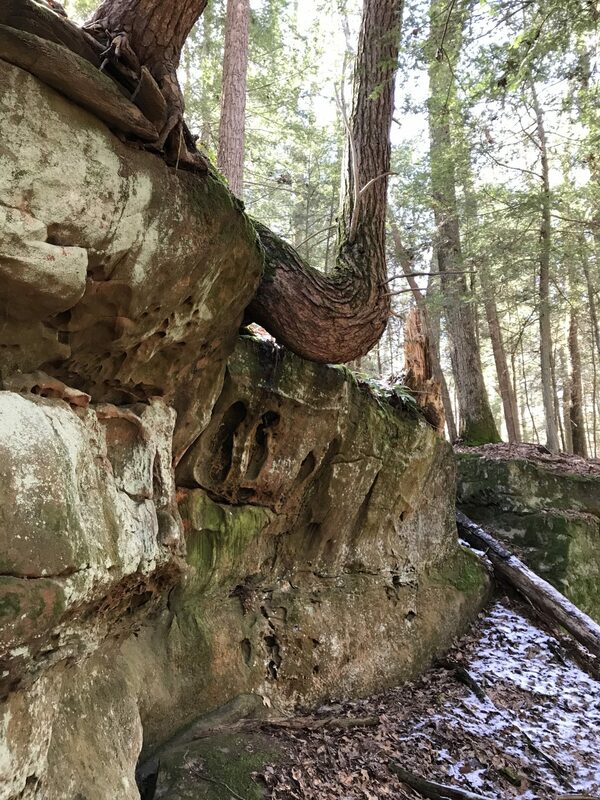 One never tires of feasting his eyes on the majestic cliffs and the graceful, rolling summits of the ranges (“Sandstone Cliffs, February 4, 1923,” an excerpt from Edward S. Thomas, 1981, In Ohio Woods and Fields, page 6). 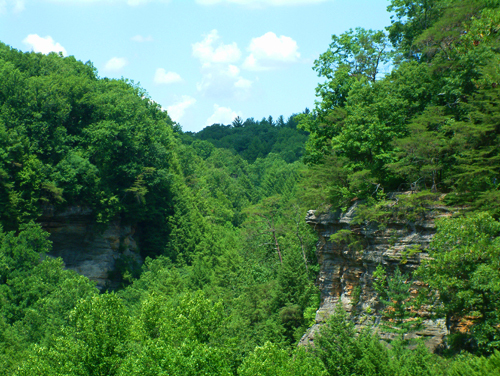 Clear Creek Metro Park lies at the north edge of the Hocking Hills, one of Ohio’s most scenic and diverse regions. Within the region over 10,600 species of plants, animals and fungi have been documented and cataloged. Clear Creek Metro Park at nearly 5,200 acres is Ohio’s second largest Metro Park and Ohio’s largest State Nature Preserve with 4,769 acres dedicated. Boasting over 850 species of plants, 160 species of birds, and 40 species that are listed on the State’s Rare and Endangered Species list, Clear Creek represents one of Ohio’s truly spectacular natural areas. It is one of only a few areas in Ohio’s southeast forest and hill country that hosts over 100 species of breeding birds annually. Clear Creek is recognized as one of Ohio’s 66 Important Bird Areas by Audubon Ohio. Within the Hocking Hills the prominent geological feature is the massive Black Hand Sandstone. This formation was created 335 million years ago during the Mississippian Period when a vast inland sea covered the region. Braided streams that flowed into this ancient sea carried coarse and fine-grained sands depositing them in a deep incised valley. As time passed and the sea retreated, the land uplifted and these deposits were cemented together into the Black Hand Sandstone. Erosional forces of nature then went to work carving out the massive exposures and ravines we enjoy today. The glaciers descended upon the Ohio landscape from the north further sculpting and shaping the land. Just west of Clear Creek, both Illinioan and Wisconsinian glacier evidence can be found. The proximity of these glaciers created very cool, northern environments ahead of their fronts that supported plants more closely associated with a northern climate. Contrasting the glaciers was the slow moving Teays River flowing from the south, carrying seeds of southern species. It occupied a very large, broad river valley west of present day Clear Creek. A tributary of the Teays River flowed from east to west through the valley and into the Teays River, opposite of the flow of Clear Creek today. As the glaciers crept south they dammed up this river and its tributaries. Near the west end of the Clear Creek a large dam formed and eventually erosion and pressure broke this dam and the water began flowing the opposite direction creating the drainage pattern of today. This explains the “hour glass shape” of the Clear Creek Valley. One can still observe this pinch point today when visiting the valley. This stream reversal also explains how the original seeds of southern species, such as the Great Rhododendron, became established in the valley. The combination of these natural forces and events occurring in the Clear Creek Valley explains the overlap of northern and southern species observed today and why the area is so diverse. In the region, two forest concepts that benefit bird diversity standout. The first is the overall expanse of mature deciduous forest. In the vicinity of Clear Creek this somewhat continual block of forest extends from the park property onto private property and is basically connected to the northern edge of the State Park areas at Cantwell Cliffs. Many forested species, such as Cerulean Warbler, Wood Thrush and Scarlet Tanager, require these large unbroken tracts to maintain strong populations. 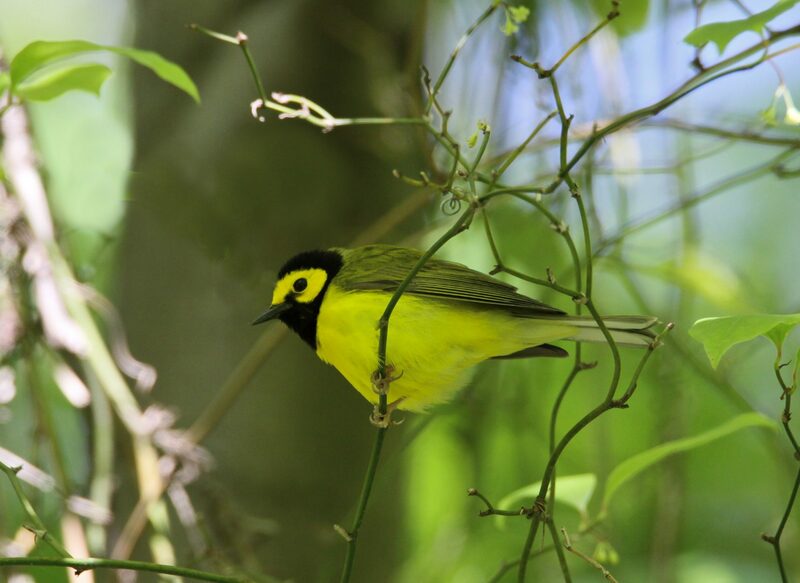 With the regional location of this forest in southern Ohio more southern species such as Hooded Warbler, Worm-eating Warbler, Kentucky Warbler, and Louisiana Waterthrush and Yellow-throated Vireo are found nesting annually. 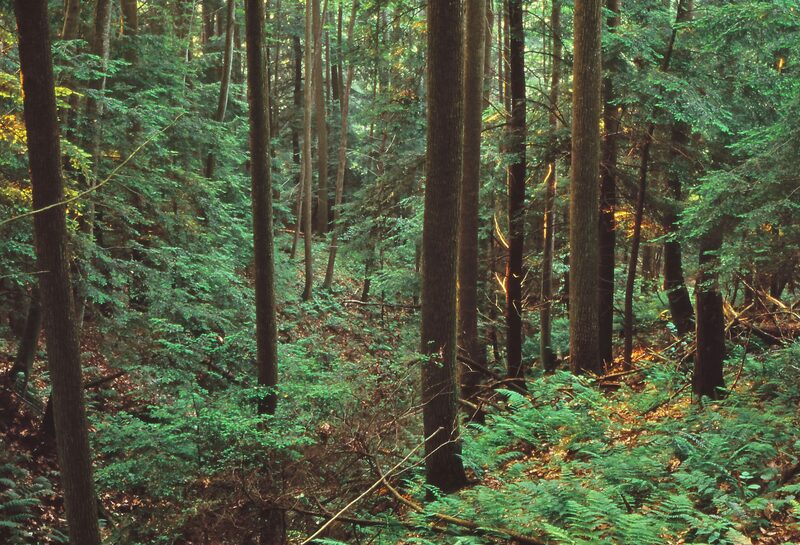 Nestled in these forested areas are the Eastern Hemlock Forests of the ravines and north facing slopes. It is in these cooler dark environs that northern species of birds such as Hermit Thrush, Magnolia Warbler, Black-throated Green Warbler, Blue-headed Vireo, Winter Wren and Canada Warbler nest. The interest in the Clear Creek Valley from a natural history standpoint began in November 1923, when renowned Ohio Naturalist Dr. Edward S. Thomas purchased a 69-acre parcel of land in what is now Clear Creek Metro Park. As Curator of the Museum of Zoology at The Ohio State University, Thomas’ interests in field collections for the museum likely convinced him to push for surveying, collecting and ecological research on the property. He named the property “Neo-Toe–ma Valley” in honor of Ohio’s first record of the Allegheny Woodrat, whose genus name is Neotoma but correctly pronounced Ne-Ott-e-ma. At one time, and possibly still today, the Neotoma Valley represents one of the single most ecologically studied valleys in southeastern Ohio with no less than 130 articles, thesis and even a book dedicated to its unique ecologically. 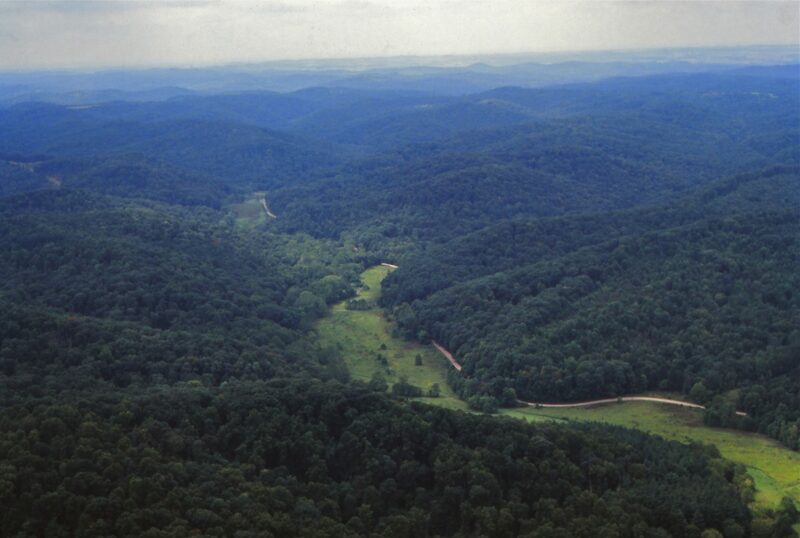 It was in this valley in 1923, that the first bird census in Hocking County was conducted. Between 1923-1940 Dr. Thomas and others conducted annual surveys of the breeding birds. At its conclusion in 1940, the survey had documented 57 species of birds on 69 acres of reverting land that consisted of young and successional forest and heavily grazed fields. Of note was the presence of breeding Bewick’s Wrens through at least 1937, a species widely regarded as extirpated from Ohio’s breeding bird fauna today. Today over 100 species of birds breed in the valley and the adjacent lands such as Fern Gully, with the eastern wood warblers heading the list. 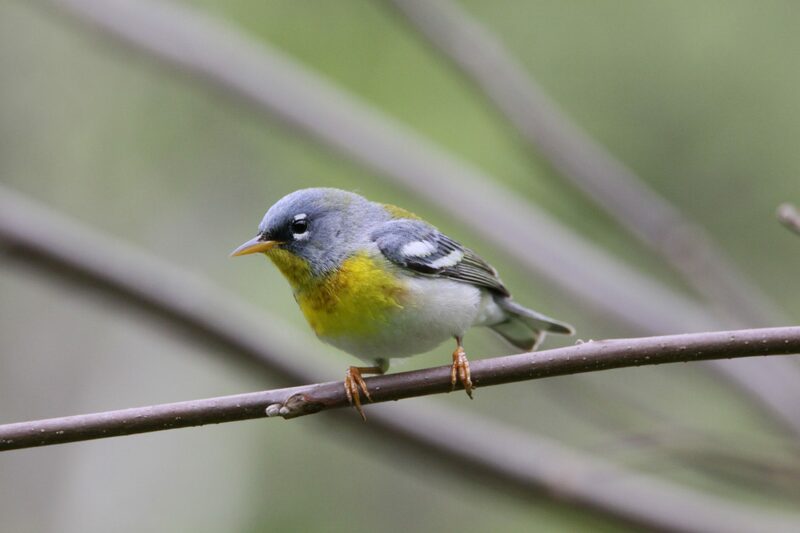 Twenty (20) species of warblers annually nest in the valley including the Cerulean Warbler, whose populations have declined by nearly 60% in Ohio since the mid-1980’s. Other warblers of interest include: Worm-eating Warbler, Magnolia Warbler, Kentucky Warbler, Blackburnian Warbler and Chestnut-sided Warbler. Other notable species within the park include Veery and Henslow’s Sparrow and the Hemlock Forest associates mentioned earlier. How does Fern Gully fit into the preservation and protection of this wonderful natural area? The entire watershed of the property drains into and through land currently protected by Metro Parks and directly into Clear Creek. The main gorge contains numerous spring-fed seeps that along with intact surrounding forest resulting in a clear, cool stream flowing through the property and supplying water of high quality to Clear Creek. 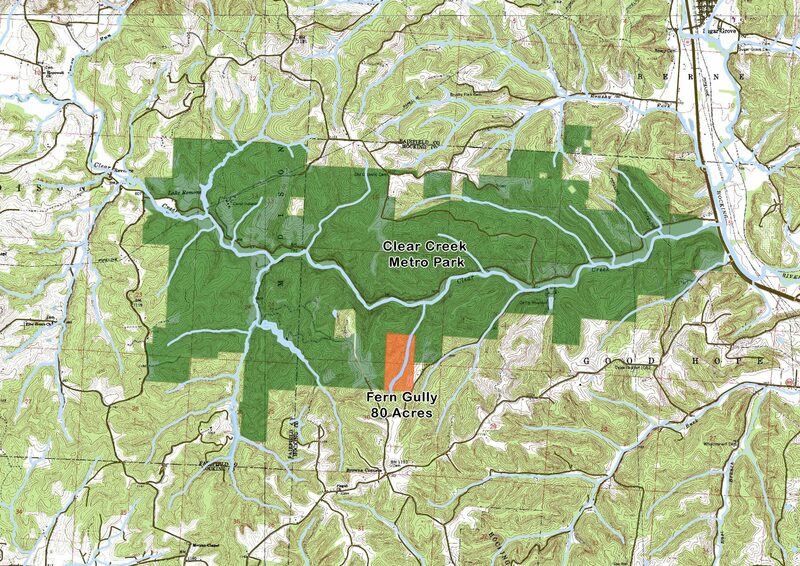 The parcel is nearly all forested, which adds a “piece to the puzzle” of the larger expansive forest that Clear Creek and the surrounding land represents. Maintaining this forest cover is essential to water quality, wildlife and the plant life flourishing in the gorge. 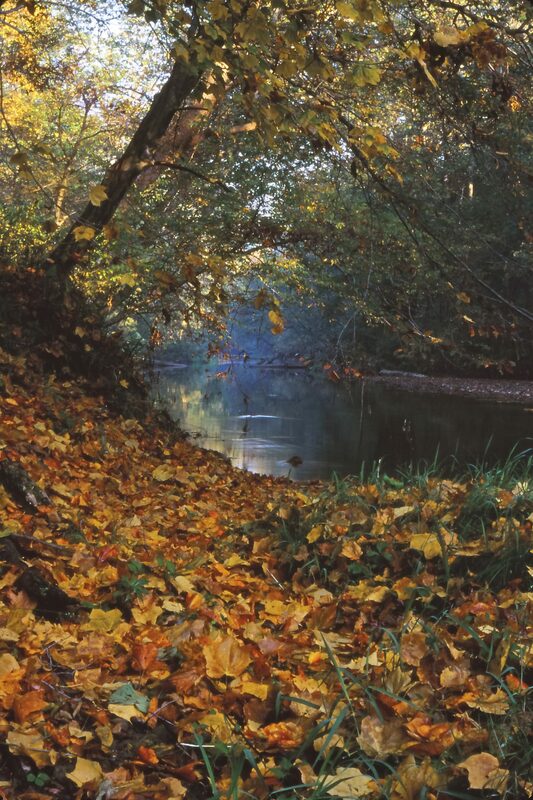 Clear Creek was established in 1973, when the family of Allen F. Beck generously donated nearly 1,200 acres of land to the Columbus and Franklin County Metro Parks. In the late 1980’s and late 1990’s the family of William and Emily Benua donated or bargain sold collectively an additional 1,200 acres. Much of the land in Clear Creek Metro Park comes from three sources. The Allen F. Beck and Emily Benua families had been acquiring and preserving valley properties for decades, and Oscar Barnebey owned valley land on which the Camp Indianola church camp was built. The Ohio State University later converted the church camp to the Barnebey Center, a natural resources lab. In the late 1960’s there was talk of damming the valley and turning it into a reservoir. After this project was defeated, the Beck and Benua families began donating their land to the Franklin County Metro Park system. When OSU abandoned the Barnebey Center, Metro Parks was able to buy it. The park now contains about 5,000 acres of woods and fields. This preserve honors former Columbus businessman, Allen F. Beck, who in the 1920s recognized the area’s intrinsic values and began acquiring and nurturing these lands. Later, the lands were donated to the Columbus/Franklin County Metro Parks to become the nucleus of this large natural resource conservation area. Edward S. Thomas purchased an 80-acre tract there in 1921 and dubbed it Neotoma Valley. On March 5, 1922, Thomas wrote his first column, titled “Our Birds.” That was the beginning of a long relationship between The Dispatch and Thomas: He wrote weekly columns for the next 59 years. Many of his column’s subjects were related to Clear Creek. The Clear Creek Valley is a treasure-trove of natural history embedded among some of the best scenery in the state. About 800 species of plants provide the greenery, including many rarities. Thick forests blanket the slopes, and stately hemlock trees shade the cool waters of Clear Creek. Jagged sandstone outcrops host specialized plant life, including many ferns – the rarest of which is the resurrection fern. A tropical species, it reaches its northern limits in Clear Creek Valley. The only population in the valley grows on the western face of Leaning Lena, a massive sandstone slump block that looms over the road.